For some, Bingo may seem like a game only played by senior citizens or at a holiday resort to while away some time. However, this traditional game can offer some big cash prizes and has entered the digital age offering fast paced and exciting game play. Not only can you play Bingo online but many venues now offer digital terminals to really speed things up. In this guide we take a look at the game of bingo in Australia from laws and game play to venues where you can play. 1.2.1 What is the legal age to play bingo? 1.2.2 Are my winnings from bingo taxable? 1.2.3 Do I have to download any software to play online bingo? 1.2.4 How can I be sure that bingo games are fair? Though just as much a form of gambling as poker or using gaming machines, bingo has always been seen as a soft form of wagering; a social game often cited by opponents to gambling as being more of a community activity. Though the popularity of many other forms of gambling wax and wane, this traditional game has remained a buoyant market; largely due to its widespread foundation in senior citizen and rural communities. 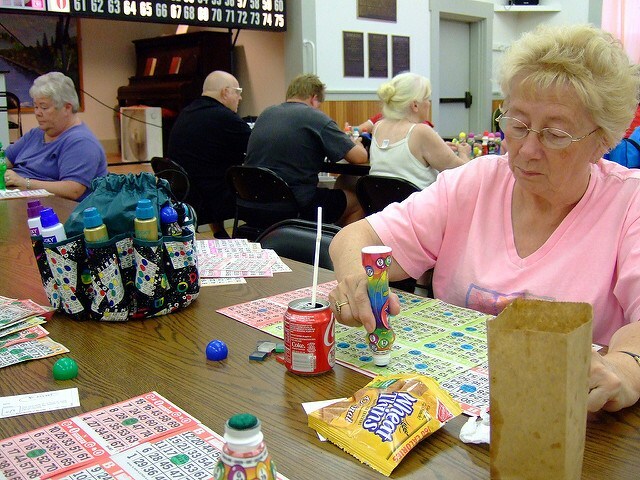 The largest markets for bingo are in the UK, USA, Canada, Brazil and Australia. Typically, the game has always been considered a working-class activity as well as being associated with ‘old ladies’ but the shift to online gaming has changed this demographic. More commonly, online bingo players are an average age of 40 with two in five being men. The widespread availability of gaming sites has also expanded the market to countries that previously did not enjoy this form of gambling including European nations like Sweden, Spain and Italy. In fact, because these countries had no history of bingo being a game for old women, the uptake online has been higher in men. Online bingo is changing the demographics of this quick game with good odds. Image via Flickr. Here in Australia, bingo enjoys a popular reputation for being sociable and offering reasonable stakes for potentially high wins. You can find bingo events in social clubs, bars and bingo halls across the country and whilst there will always be women of a certain age enjoying the game you could be surprised at the appeal it has for younger players. If, however, you don’t fancy hitting up the halls then online bingo is an easy way to take part. Gambling in Australia is governed by a variety of different laws and vary state by state as well as by federal legislation. But, on the whole, gambling falls into two categories; land based (physical) and online (virtual) gambling. Playing bingo for cash at land based venues requires a special license and players should ensure that the establishment where they are playing bingo complies with local legislation. This ensures that the games meet the regulations and provide fair mechanisms for awarding cash prizes. When it comes to playing bingo online for cash game play falls under the jurisdiction of The Interactive Gambling Act (2001). This piece of legislation makes it illegal for both Australian and foreign sites to offer interactive gambling services to Australian citizens. The legislation covers gaming such as online poker, casino games and bingo. However, the law places the onus of compliance on the company and not the individual. Australian companies fall under the jurisdiction of the federal government and can easily be policed but this is not the case with foreign gaming providers. In reality, this means that Australian residents may still access the services of online gaming services offered by sites that are based outside of Australia. Playing bingo in Australia is governed by land based regulations as well as the Interactive Gambling Act. Off-shore companies may not advertise their services to residents but residents can access them. Image via Google. What is the legal age to play bingo? Irrespective of the grey area surrounding the legislation of online gaming, the law on gambling in Australia is quite clear; you must be at least the age of 18 to do so. If you are playing bingo in a land based venue then you will need to be able to prove your age and any company offering online gaming should also require evidence of your identity; often this is done via scanning a copy of your driving license or passport when you sign up for an account. You should be aware that most online gaming providers employ strict age compliance technology and any doubt as to your age may result in your account being frozen. Are my winnings from bingo taxable? Though Australia does charge gambling taxes, these are levied on the gaming operators and not on personal winnings. This means any money you are lucky enough to win are 100% tax-free whether you play online or in a land based venue. Do I have to download any software to play online bingo? This varies depending on the site you are playing with but most online bingo operators operate an in-browser service. This means you don’t need to download any specific software; however, to keep your personal (and banking) information secure, you will be required to create an account. Most providers will also require you to confirm proof of age. How can I be sure that bingo games are fair? All gambling sites must adhere to the gaming laws issued by their local jurisdiction. For land based venues, bingo operators must hold a local state license and the game must comply with federal laws. When it comes to online bingo games, the operator is governed by local laws. This means that a UK operator must conform to legislation issued by the UK. All of those sites we have selected below have been issued with licenses from the prevailing jurisdictions in their area which means their license is issued to provide fair games. Numbers are generated at random and these mechanisms/algorithms are regularly inspected. Whether you are playing online or at a land based venue, bingo is one of the most simple games to play which is one of the reasons it remains so popular. There are variations to the games (see below) but principally the format is the same whichever type of bingo you are playing. The arrangement of the numbers in a grid format grid make it quicker for players to locate a number and ‘daub’ it when they are called. You pay to play by the number of cards you have in each game with some players preferring to manage just one card whilst others can play multiple cards. You can play multiple cards but without auto-daub you’ll need to be swift and eagle-eyed. Image via Flickr. The caller will draw balls from a machine (or selected at random for ‘virtual bingo games’ online) and players who have the corresponding number on their card will mark it off. A house (‘housie’ or jackpot) is called when you have matched all your numbers on a card with most venues and sites operating a ‘first-past-the-post’ system so a single call of ‘housie’ marks the end of the game. Winning prizes can vary by venue, game type or site but generally a full line across your card (horizontally, vertically or diagonally) can represent a smaller win with four corners also being lucky. Some games also feature winning shapes but the principle remains the same; match the called balls on your card (or multiple cards) and call ‘housie’ before any other player to win. In some games, the centre of the grid is pre-marked as a ‘free’ ball thus making it easier to match a diagonal line. Online games often feature an ‘auto-daub’ function which means you don’t have to scan multiple cards manually to match your winning balls. Some casinos and larger bingo venues also operate terminals or electronic gaming tablets that offer this feature. 75 Ball Bingo: A card consists of the word ‘BINGO’ written across the top with a grid beneath containing randomly chosen numbers in sequential order. In a 75-ball game format, numbers below the B will be 1-15, beneath I 16-30, N 31-45, G 46-60 and 0 61-75. There are usually several ways to win on this format with vertical, diagonal and horizontal lines being lucky as well as a ‘housie’ of 24 numbers. Patterns may also be used to determine a winning combination. 90 Ball Bingo: Cards are arranged in three horizontal lines with nine columns. The first column contains the numbers 1-9, the second 10-19 and so on. Players compete to match the numbers on, first, a single line, then a second with a full house signifying a jackpot. This type of game is the more traditional variety of Bingo and is most common in Europe, particularly with UK sites. 80 Ball Bingo: Numbers are arranged on a grid made up of four columns and four rows with each column being a different colour. Play is similar to 75-ball bingo with winning patterns in addition to winning lines. Some sites offer their own variations of bingo that are unique to them but generally they will follow one of the above formats. It is a good idea to familiarise yourself with the rules and the winning combinations before starting a game. Most bingo games are run by social clubs and events are generally listed on the national Bingo Club website. Some of the events listed are geared more towards senior citizens with smaller jackpots designed for casual or social gaming. However, more and more clubs are able to offer big cash prizes due to the rise in demand and flourishing attendance. Every state has at least one casino, usually situated in the capital city, and generally you can find that they offer a weekly bingo event. There are no national chains that operate across Australia providing bingo halls, but you can find details of casinos and local venues where you can play bingo in each of our city gambling guides. Games: One main game, 75-ball version. Other Games: Blackjack, Keno, video poker, pokies, 3D slots and free play. Bingo Australia is one of the most popular sites for Australians to play online bingo. The main reason is that play used to be in AUD (now USD) and the site has been running for over 15 years with very few complaints. The site is not only popular in Oz but also Canada, Spain and Croatia. The site is easy to use and has a relatively low minimum deposit plus a good range of games including Bingo. The main lobby has one main bingo game which costs $0.25 per card to play with prizes varying depending on the number of players. Additional feature games are available once you are registered that usually have guaranteed jackpots. You can also play games for fun with no stakes or prizes. The community on Bingo Australia is pretty good and chat is available for the more socially minded. Don’t confuse the site with Bingo Australia Pty. Ltd who run hospitality events. Other Games: Poker, Keno, casino and table games plus slots. Bingo Billy has won the prestigious ‘Bingo Site of the Year’, awarded by WhichBingo, five times (2007, 2008, 2009, 2011 and 2012). It was founded by an American woman called Billy who fell in love with the bright lights of Las Vegas when she worked as a casino dealer. The same casino vibe is employed with the games themselves which are powered by Parlay. This is a good site with a nice chat feature and regular games with steady winnings. Other Games: Poker, Keno, casino and table games plus video slots. Games start from $0.05 per card with standard prizes per game being $70 and jackpots of $1000+. The site will be familiar to anyone who has used other Digital Entertainment Services sites (see below) and Bingo for Money is easy to use, has good graphics and features auto-daub. Regular players are making weekly winnings in excess of $1000 with some winning much larger jackpots. Games: 12 different games mostly 75 ball. One of the longest running online bingo operators, the Bingo Hall site is now owned by Digital Entertainment Services who run Vic’s Bingo and South Beach Bingo (see below). There is a good range of games and an excellent community which makes game play more interactive. The site has Flash technology so you can play in-browser and the graphics and sound are pretty good. You can play up to 24 cards at a time using auto-daub with prizes ranging up to several thousand pounds. The site is ranked 3rd in the word in the bingo site category and is Australia’s 687th most visited website. Games: 75 and 90 Ball. Good range of themes. The site has been running for over twenty years and has honed its offering down to provide a slick gaming experience. The variety of games is good and offers a range of cards to play with good prizes. The site has plenty of action and Cyber Bingo has awarded over $1,000,0000,000 in cash since 1996. It’s a popular way for Australians to play online bingo as well as Canadians and Americans. Don’t be surprised to find Germans and Spanish players in chat rooms as well. Cyber Bingo offers a great site for playing bingo with some good bonuses of sign up and deposits with a good loyalty program. Get Minted Bingo is a wholly owned subsidiary of 888 Holdings and is regulated by the Gibraltar Gambling Commission. The site is a little dated in design but does offer a good range of 75 and 90-ball games plus a feature games called High-5. Coverall and progressive jackpots are available 24/7 with the site reportedly awarding prize money of almost $1 million per day. Games: 3 different games mostly 75 ball. Another Digital Entertainment Services site offering an almost identical portal to ‘Bingo for Money’ (see above). The main variation is in the minimum deposit value but Instant Bingo has many of the same features. Games: 75,80 and 90 ball variations. Ladbrokes is one of the largest international bookmakers and operates a range of sites offering plenty of online gambling opportunities. Their bingo site is very comprehensive and features a wide selection of games with different costs per card, jackpots and prizes plus themes. Though based in Gibraltar, the site is regulated by the British Gambling Commission. Games can also be played using the Ladbrokes app which can be downloaded to your smartphone/tablet. A wholly owned subsidiary of 888 Holdings Limited, Moon Bingo has a nice selection of games to play with regular prizes and jackpots that should keep you engaged. A simple design with good graphics, Moon Bingo attracts a lot of international players. You can also play Moon Bingo on the go using their app. This site is operated by Digital Entertainment Services who have an administration base in Antigua and Barbuda. They are regulated by the Curacao Gaming Commission and also operate other sites including Vic’s Bingo. There are usually 1200+ players online so you are guaranteed to get some chat whenever you play. Games cost $1 a card and prizes start at $7 with jackpots ranging up to $25k. South Beach Bingo has two free test rooms (one 75-ball and one 90-ball) so you can trial the play before committing a stake. Play is in-browser using flash or you can download their player. This can make play faster if you have a slow connection. Prize fund pay-outs happen once a week. Vic’s Bingo is an easy site to use and doesn’t have too much ‘clutter’. There is a good community if you enjoy chatting whilst playing and regular players seem to do reasonably well. There are six rooms to play in with around 1800 players online at any time. The league table of players shows that monthly winnings range from $50-$10,000 with some bigger jackpots available. The site has been running for over 15 years and has a good reputation offering good live help and email support.